Well, one is done, two are about to finish, and I have to start the last one. 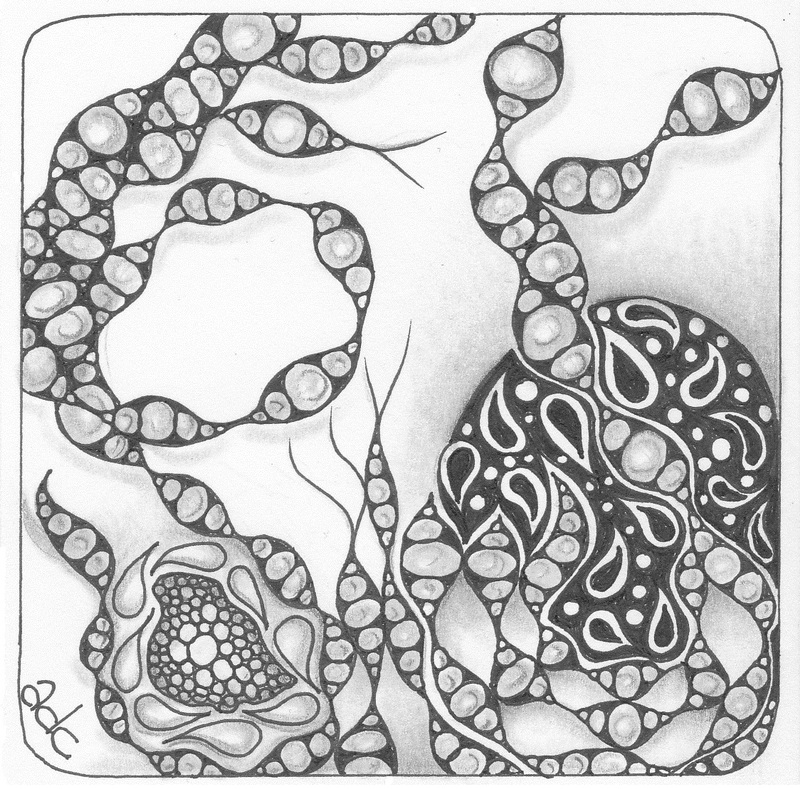 Only if you know the string (you'll find it here), you can see it in this zentangle. The second challenge was also a string quest. Linda Farmer has posted another string by Barbara Finwall. The string suggestions on TanglePatterns.com are a very useful resource for all of those who are in a string dip! I found this one extremely defiant. 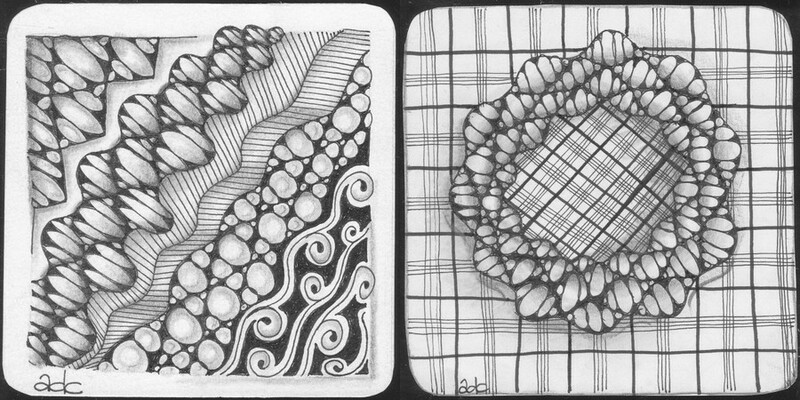 And it was a great opportunity to play with my own first tangle pattern! So yes, getting that one ready for sharing it with you was the 3th challenge. Because of all the orbs, one of my favorite songs jumped into my mind and with a wink to The Beatles (read more) I would like to name it: Orbs-la-Dee ("Dee" is the initial of my husband's surname). 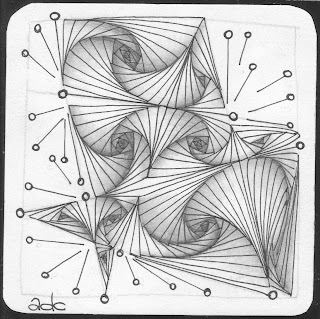 Hopefully, as soon as you are drawing this pattern, you'll sing "Orbs-la Dee, orbs-la-da, tralalalalalala!" and feel happy!! Step 1-3: Drawing regular spaces might need some practice.... But irregularity gives very nice results too! Step 5: Turn your tile 180° for drawing the orbs in the same direction! Step 7-8: Add some shade and blend (use a paper stump, great tool!) for the wonderful 3D-look. At first, Step 7 said: "add rounding" instead of "add shade". 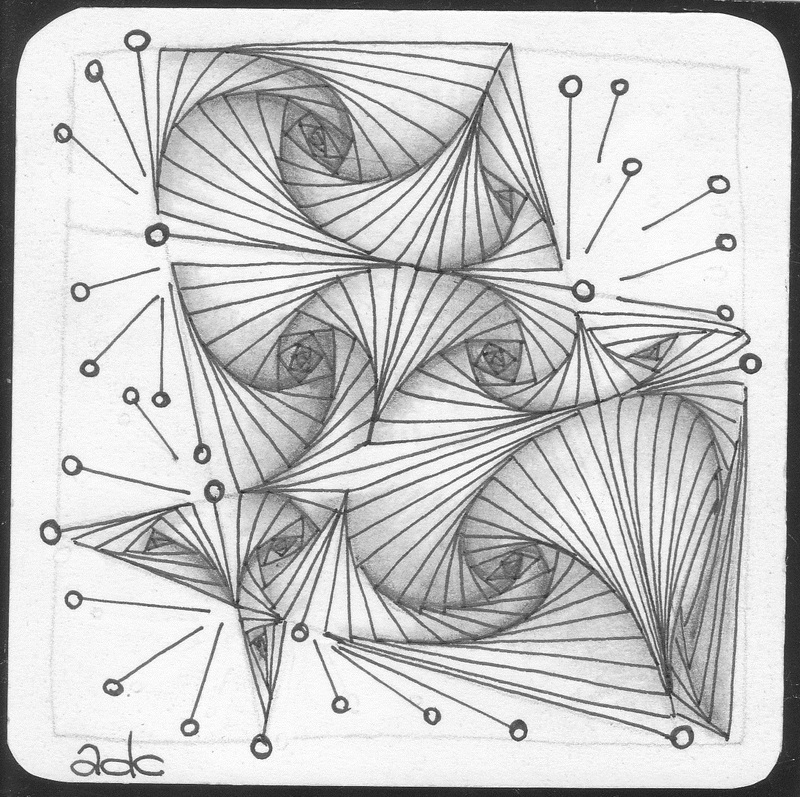 Just a few weeks before Linda Farmer introduced Orbs-la-Dee on TanglePatterns.com (June 7, 2013) I discovered what rounding really is. Thought I had enough time to adjust my post, but then it completely slipped my mind…. It's okay now! 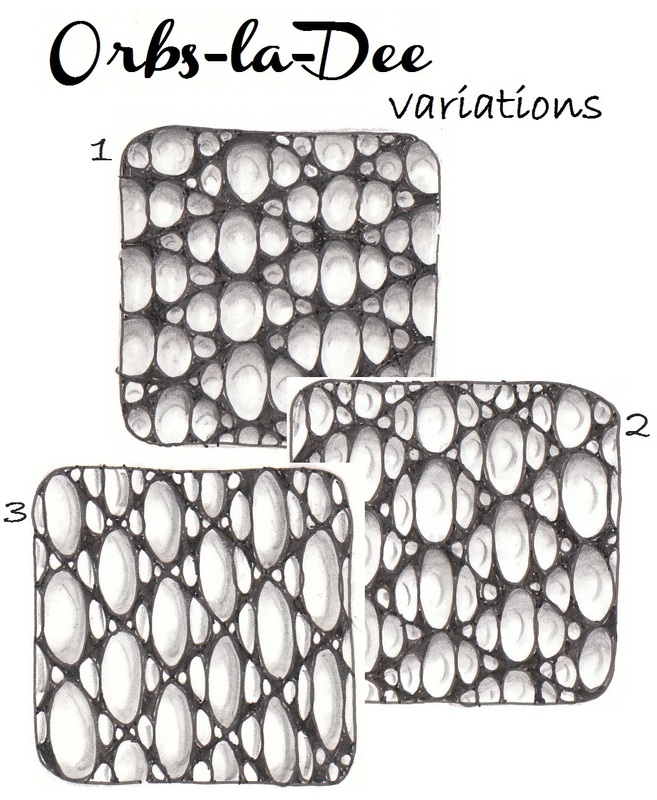 The variations are made by changing the basic lines: 1) about the same as the curvy ones from the step-out; 2) higher and smaller; 3) diamonds. Have fun with exploring the possibilities! on "Tickled To Tangle" from Adele Bruno. She posts a string challenge every Tuesday. 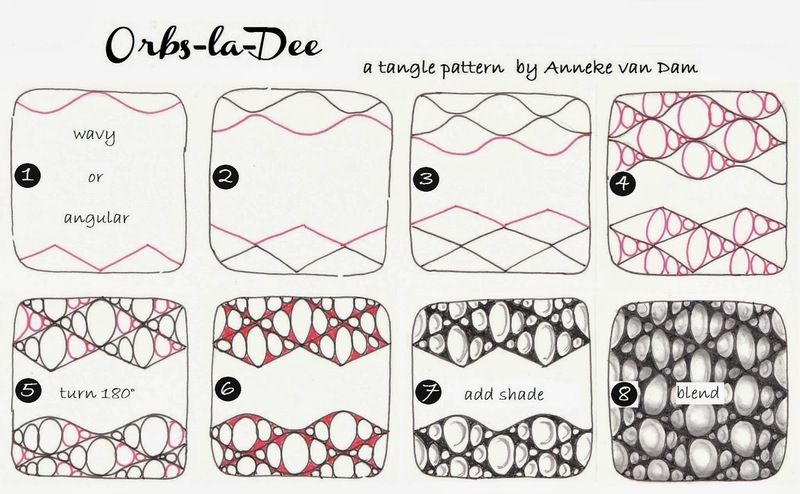 Look here: Weekly Challenge #298 - Use My Tangle (January 9, 2017) on "I am the diva" from Laura Harms. She posts every Monday. 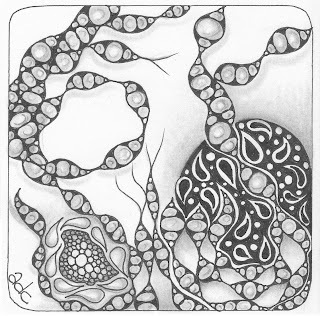 I am extremely proud about all those tanglers, who took the time to play with Orbs-la-Dee. They've created such wonderful tiles and ZIA's! Adele and Laura, thank you very much for picking out my pattern! Haven't seen this patterns anywhere, am I right?? If I'm wrong, please tell me. Should the name(s) already exist, please do the same! Quite unique, these patterns. Orbs-la-dee is a bit like raindrops on a window pane. I can't wait to use it! Thank you, Faith, I like your description! Please show me what you've made with it when you're finished; you'll be the first! Orbs-la-Dee, Fun-for-me, Gotta tryyyyy it! La-la-la-la, Orbs-la-Deeeeeee! Glad you are posting tangles, and I am enjoying the tiles you share. cool, it's very similar to Carole Ohl's Inapod, but with it's own twist. Hi Anneke, What a surprise to see my name here! I'm so proud that you used one of my strings for your wonderful new pattern... and I love the pattern name. It looks like it will be just as much fun as it's name. However, Rounding is not the shadow on a 'pearl' but rather the rounding, or filling in, of angular corners in a tangle, like one does in N'Zeppel. Thank you, Margaret, this means a lot to me! 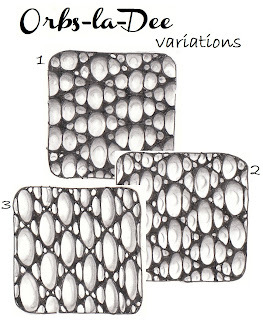 Can't wait to see it in one of your unique zentangles! Thanks for your correction! Only a little while ago I've discovered my mistake about Rounding on Shelly's blog. Thought I had enough time to change my post, and then it completely slipped my mind… But I will make the adjustment to avoid further confusion! Hi Arwen, Thank you for your nice comment! I'm glad you had fun with Orbs-la-Dee!! Wat een leuke tangle, deze ga ik met veel plezier gebruiken! Although I am a dedicated follower of Zentangle®, I'm not (yet) a Certified Zentangle Teacher®.